Pat Conroy didn't have a home state until he was 15 years old, and that state was South Carolina. He traveled as a Marine brat, but then his family moved to Beaufort, SC, where he attended The Citadel, the Military Academy of South Carolina. He went on to become a bestselling using his own life as material. TheGreat Santini is about his family's life in the state. The novel was made into a film in 1979, orginally under the title, The Ace. 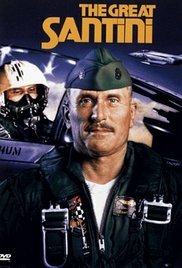 The performance of Robert Duvall as a larger than life Marine fighter pilot earned him one of his many Oscar nominations. Though the novel deals with the family's commitment to the Catholic Church (in positive and less than positive ways); the film leaves this aspect of family life far in the periphery. It's a great family drama. It's not only set in South Carolina, it was filmed there as well. Other films have been made from Pat Conroy novels, and two have been set and filmed in South Carolina: The Lords of Discipline (a fictionalized telling of Conroy's days in The Citadel) and The Prince of Tides (a fictionalized telling of the adult Conroy's coming to terms with the traumas of his youth). A less critically acclaimed yet very popular writer, Nicolas Sparks, set one of his most successful novels, The Notebook, in South Carolina, and it was also filmed there. (I'll give the chick flick this: it gave work to one of my favorites, James Garner.) Another Sparks novel, Dear John, was also set and filmed in South Carolina. Nothing says Boomers like Lawrence Kasden's college reunion classic, The Big Chill. A great cast including William Hurt, Glenn Close, Jeff Goldblum, Meg Tilly, and Kevin Kline get together in South Carolina (set and filmed) to reminisce about how awesome the sixties were. 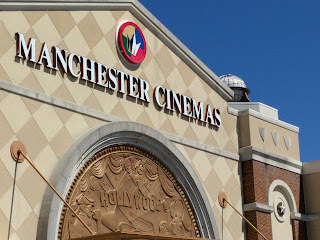 The big screen film we saw in South Carolina was not set or filmed there. Risen set in first century Palestine and was filmed in Spain and Malta. It is the story of Christ's resurrection from the perspective of a soldier at the cross -- who Pilate charges to find the body of Jesus. I just don't understand why none of the Gospel writers wrote about the Roman tribune who hung out with them before the Ascension. Last week, we wrote unkindly about our visit to a Regal Theater in Georgia. This week's experience was better, but nearly $20 for two matinee tickets? One thing that was cool was their use of salt dispensers filled with popcorn kernels to keep the contents from coming out too quickly or clumping in humid weather. And where else but in a movie theater would you look for black bean dip?